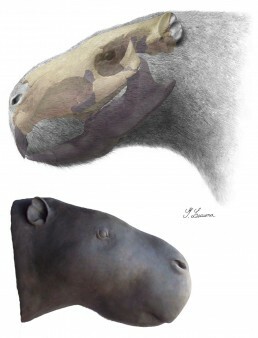 The largest rodent known may have used its front teeth as tusks, scientists at the University of York and The Hull York Medical School found out. Josephoartigasia monesi is an extinct species of South American caviomorph rodent which lived during the Pliocene to early Pleistosen (from approximately 4 to 2 million years ago). It is also known as the giant pacarana, after its closest living relative. It is the largest fossil rodent ever found, with an estimated body mass of 1000 kg and was similar in size to a buffalo. Josephoartigasia monesi is known from an almost complete skull, which was recovered from the San José Formation on the coast of Río de la Plata in Uruguay. Discovered in 1987, but not scientifically described until 2008, the specimen is preserved in Uruguay’s National History and Anthropology Museum. Dr Philip Cox, of the Centre for Anatomical and Human Sciences, a joint research centre of the University’s Department of Archaeology and HYMS, used computer modelling to estimate how powerful the bite of Josephoartigasia could be. More precisely the research team made a virtual reconstruction of the fossil’s skull by CT scanning the Josephoartigasia monesi specimen. Then the reconstructed skull was subjected to finite element analysis, an engineering technique that predicts stress and strain in a complex geometric object. The researchers found that, although the Josephoartigasia monesi bite forces were very large – around 1400 N, similar to that of a tiger – the incisors would have been able to withstand almost three times that force. This information is based on earlier estimates by co-authors Dr. Andres Rinderknecht of The Museo Nacional de Historia Natural, Montevideo and Dr. Ernesto Blanco of Facultad de Ciencias, Instituto de Fisica, Montevideo, who first described the fossil in 2008. “We concluded that Josephoartigasia must have used its incisors for activities other than biting, such as digging in the ground for food, or defending itself from predators. This is very similar to how a modern day elephant uses its tusks,” Cox said. The research was published in the Journal of Anatomy.